Prodigal is part of a series of narrative images based on verses from Jewish and Christian scripture. The series incorporates typographic elements on corrugated paper­. Corrugated means “wrinkled” and alludes to an inner layer sandwiched between two smooth layers. Brown and earthy in color, the secret of corrugated paper’s strength rests in this wrinkled, hidden layer of hills and valleys. As a Christian, my strength rests in the God who lives within me–I am a creature wrinkled up with God. Prodigal explores the “ands” in Scripture–places where the word “and” connects actions or thoughts. In the parable of the Prodigal Son, the NASB says: “So he got up and came to his father. But while he was still a long way off, his father saw him and felt compassion and ran and embraced him and kissed him’ (Luke 15:20). Within this verse, the word “and” occurs five times, providing a bridge between actions. 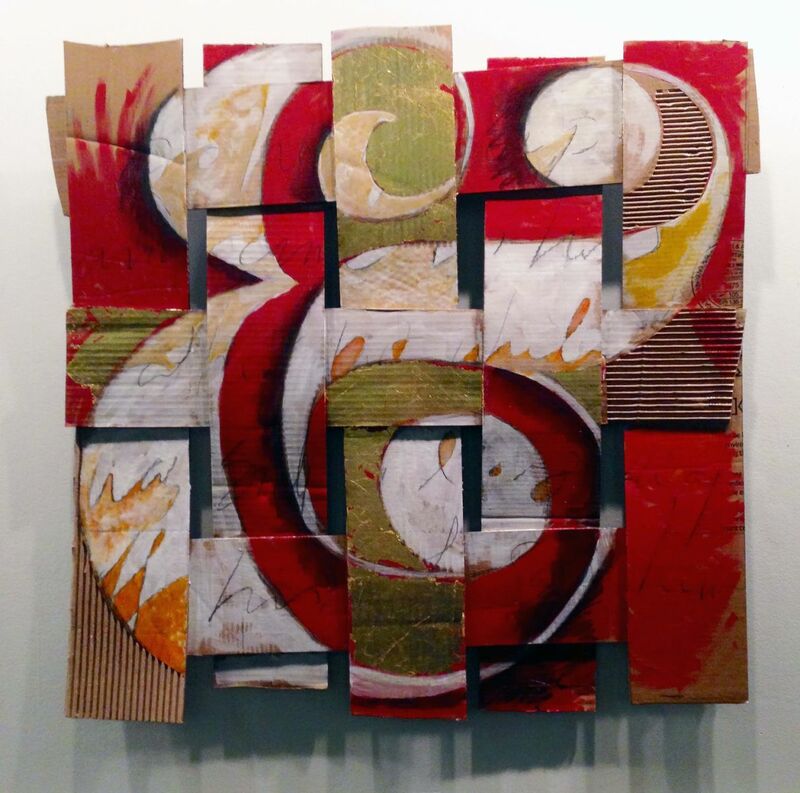 Prodigal, composed of corrugated paper in strips and interwoven, evokes the warp and weft of the father-son relationship. A son enters this world horizontal to a vertical father. There is strength in competing directions when interlaced–a vertical father embracing a horizontal son. A father’s arms are among the first to hold his son. The parable of the Prodigal begins with rebellion; a son leaves his father’s love and protection and returns to see that love demonstrated. “Prodigal” means “reckless”. The tattered, corrugated paper exhibits the scars of consequence. The red speaks to the blood of the fatted calf and a Savior’s shed blood for the sins of man. The gold represents restoration–the father places a ring on the son’s hand, the glory of the Father’s forgiveness. Prodigal speaks to the mystery of God’s love for his children–a love that sees and feels and runs and embraces and kisses the child who comes home to him. Prodigal is 36” x 36”, oil and gold leaf on corrugated paper. Michael R Carter received his MFA in Graphic Design from The University of Memphis. For the past twenty years Michael has been involved in education, from curriculum design and classroom teaching to speaking at national conferences. His teachings posts have ranged from Kindergarten to University level. In the mid-1990's, Michael was asked to develop an art program for Westminster Academy in Memphis, TN., one of the premier Classical Christian Schools in the U.S., where he would eventually teach Art, History and Latin for several years. Currently Michael is the art director for The MorningStar Journal, an online magazine produced by MorningStar Ministries in Fort Mill, SC.